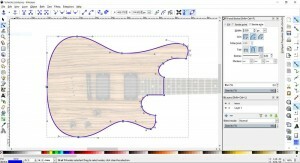 In this course, I will teach you how to use Inkscape, a powerful drawing software, to plan, design and create full-size guitar plans for printing and building. You won't need to spend money on expensive software, Inkscape is a full-featured, easy to learn (with this course), and best of all, it's FREE! 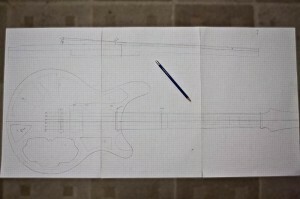 When I first started to design and build guitars, I used pencil and paper to make full-size plans. Then I started to use Adobe Photoshop, and for me, it worked so much better than paper and pencil. I could plan, design and modify as much as I wanted and then print the guitar in full size. On one hand, Photoshop was much better than paper and pencil, but on the other, it's a pixel-based software and is not ideal for guitar planning and design. Adobe Illustrator, a vector-based software, is a much better alternative for this task. However, Adobe Illustrator is costly! The old days of planning and designing the guitar on paper. Inkscape is an open-source Scalable Vector Graphics (SVG) editor very similar to Adobe Illustrator and Corel Draw. However, unlike these other tools, Inkscape is free! Don’t let the word “free” fool you, Inkscape is a full-featured software and it runs on PC, Mac and Linux. 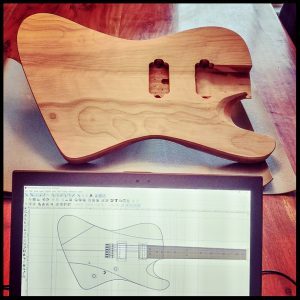 Tracing a Schecter guitar body. The opacity of the guitar is reduced. The path is selected. Inkscape is a great software for 2D drawing and I use it all the time to design guitars. Guitar design should be a fun and creative project, the software should not stand in the way of creativity, it should facilitate it. The future of guitar design is by software. This course will enable you to become proficient with Inkscape to the point of creating a full-size plan from scratch. add, delete, re-order, nest, rename, move object to layer, duplicate, etc. What Is A Pilot Course? Why is it called a "pilot" course? Because this course has not yet been created. I'm searching for a handful of interested people who are willing to participate in the creation of this course with me, in effect co-creating the course. That's why it's called a "pilot". If the pilot has enough interest and is successful, then I will then create the full course based on the feedback from the pilot. Since I'm still figuring out how to best teach this topic, you will get a big discount from the full cost of the course. Co-creation also means that you provide feedback along the way to make the course better. In return, I will be available to answer your specific questions. Is this pilot course right for you? If you are happy with these two points, then click on the Buy Now button below to register. The pilot course fee is only $7 usd. I plan to make short, digestible-size lessons in video format that can be viewed from any computer. The private links to the videos will be shared with you. I will release videos on a regular basis and your feedback, if any, in the form of comments or questions, will be requested. I expect to release the lessons over a 2-3 week period but you can pace the lessons to your liking. To be able to manage lesson creations and case-by-case feedback, I would like to get 5 to 10 students enrolled in this pilot course. Why isn't the pilot course free? A free course would enroll too many people that may not necessarily be interested in this course. Since I can only take a handful of students, a small fee will guarantee that only those very interested enroll. Although I haven't decided on the price of the final course, it will be significantly higher than the cost of this pilot. Of course, as a co-creator, you will have the opportunity to buy the full course at a much discounted price. What cannot be done with Inkscape and this course? Inkscape is a 2D drawing software. This means that you cannot design a guitar in 3D and perform 3D manipulations. Using Inkscape is the equivalent of drawing on paper but with all the benefits of digital software. To get an idea of what Inkscape can do, check out this video I made about 16 months ago. Count me in. Thank you for doing this. I started a few months ago with Inkscape but soon ran out of patience and went back to my trusty ruler and pencil. Hello Robert, I’m about to close down the registration for this pilot course so if you’re interested in joining, please do it very soon. Sorry about that! The button is fixed now. It’s not currently available but I have not forgotten about this project and it will be revived eventually… but I don’t know when. The best thing to do is to join the Project Electric Guitar Facebook group and when the course becomes available, I will announce it there.